Providing you the best range of bucket elevators and screw conveyors with effective & timely delivery. 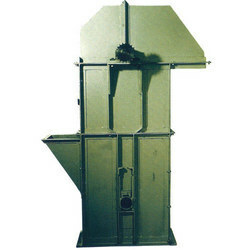 We are offering Bucket Elevators And Screw Conveyors that are used in most of the modern oil mills in India and overseas and are best known for their durability, dependability and productivity. They increase the efficiency of oil mill by conveying seeds to the machines automatically. The screw conveyors are well aligned with specially designed hanger bearings with split type bushing which is self lubricating made of special nylon rubbers. Since each screws are joined in good alignment and supported with good hanger bearings. The operation is smooth, noiseless and less power consuming. Bucket Size 6'x4"x3¼" 8'x4"x3¾" 10'x6"x3" 12'x6"x5"
Looking for Bucket Elevators and Screw Conveyors ?